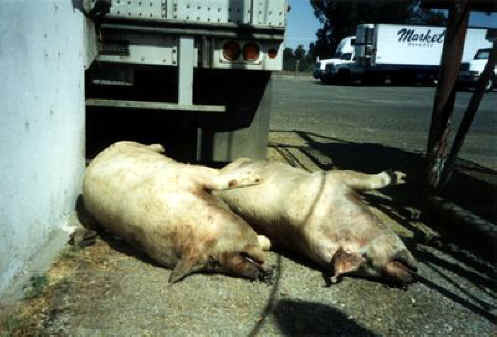 (Pig Exploitation - Transporting - 02) These are the bodies of two pigs who died in transit to a slaughterhouse. To better understand that the love of money is the root of this evil, please read the following quote from Lancaster Farming (October 27, 1990) -- "Death losses during transport are too high -- amounting to more than $8 million per year. But it doesn't take a lot of imagination to figure out why we load as many hogs on a truck as we do. It's cheaper...Even with a zero death rate that might be associated with providing more space on the truck, the hogs we save would not be enough to pay for the increased transportation costs of hauling fewer hogs on a load."